There’s no arguing that since Apple introduced the AirPlay technology, it has caught on with accessory manufacturers everywhere. The simple ease of streaming video and audio to remote destinations is effortless, and as such many manufacturers have tried to replicate the functionality. The latest effort is by Spotify who have built an Air-Play inspired feature called Spotify Connect. Spotify Connect is a service that allows users to directly stream their music from a smartphone or tablet to their stereo, much like Air-Play. However, although being released on iOS initially, Spotify Connect will be made available on Android too, making it platform agnostic – something Apple falls short on with their AirPlay implementation. Bring your music home.You walk through the door, listening to a great playlist on your phone. With Connect, just hit play on your living room speakers and the music instantly fires up, right where you left off. You won’t miss a beat. 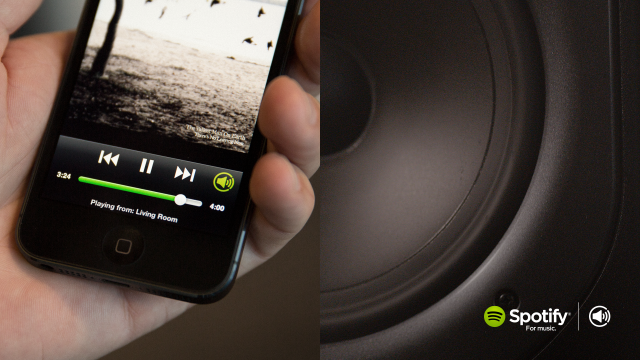 The Spotify Connect App will allow you to pick which room of the house you want the music to play in and allow you to simply push it to another mobile device on the fly. The cool feature which again trumps Apple’s AirPlay is the ability to play a game or answer a phone call without the music being interrupted. Spotify Connect – An Streaming Alternative? There are several manufacturers lined up to partner with Spotify Connect, so it does mean the purchase of some new hardware to get all these new streaming goodness, but Philips, Denon, Marantz, Hama, Pioneer, Bang & Olufsen, Revo, Yamaha and Argon are all building compatible systems, which will be marked on shelves with the Spotify Connect logo. It seems Spotify Connect also takes advantage of the Bluetooth low-energy standard since it makes a bold effort to highlight battery-friendliness as one of the key features of the technology. Is there room for another streaming technology in our houses, with separate hardware requirements, or are you guys sticking with Apple’s Air-Play? Let us know in the comments section below.